If your eye is functioning properly and allowing you to see in focus that means the surface of your cornea has a spherical curve – similar to the shape of a basketball. The light rays that pass through the eye bend toward the center and allow the eye to focus on one image. For some people, the cornea’s surface can become curved – similar to the shape of a football – with flatter and steeper curves. Because of this uneven curvature, the vision becomes distorted. This irregularity is called a corneal astigmatism and causes blurred vision because the light rays are not focused at one spot. Some people have both a cataract and a corneal astigmatism. Patients who also need cataract surgery have the option of an implantable lens that can treat the cataract and corneal astigmatism at the same time. 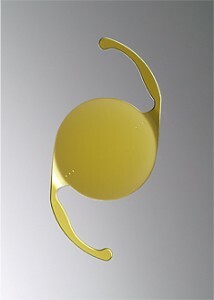 If your eye surgeon is using the AcrySof Toric lens (pictured) for cataract surgery, that same lens can reduce or eliminate the corneal astigmatism and improve distance vision. This particular lens is a single-piece, foldable lens that the surgeon implants in the eye during cataract surgery to replace the clouded lens. Its unique shapes also works to treat corneal astigmatism. Have you experienced corneal astigmatism? Did you have surgery to correct the problem?